Atlas V variants each carry a three digit designation. The first digit indicates the diameter of the payload fairing in meters. The second digit refers to the number of strap-on solid rocket boosters (SRBs). The last is the number of engines powering the Centaur upper stage. 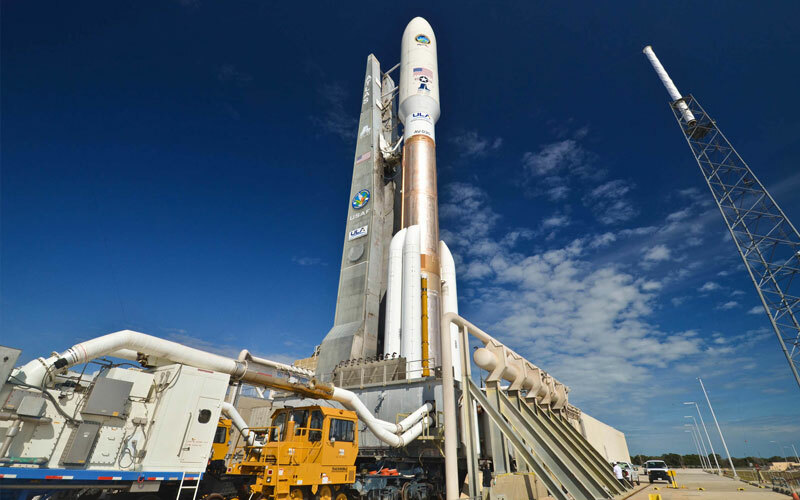 The Atlas V is the largest and most powerful launch vehicle offered by United Launch Alliance (ULA). The vehicle was originally developed and built by Lockheed Martin and was launched for the first time on August 21, 2002. It became part of the ULA lineup in 2006 following the founding of the joint venture between Lockheed Martin and Boeing that created the aerospace titan. The Atlas V is the second most powerful launch vehicle in the world (behind the Falcon Heavy). Additionally, the vehicle is the fifth most powerful in history (behind the Saturn V, the Shuttle, the Soviet N1 and the Falcon Heavy). The Russian-built RD-180 kerosene and liquid oxygen engine powers the Atlas V first stage. Both Aerojet and Blue Origin are currently developing engines to replace the RD-180 with an American-built alternative. These engines are also being considered for ULA’s next-generation Vulcan launch vehicle. The vehicle’s Centaur upper stage is equipped with the American-built RL10 liquid hydrogen and oxygen-powered engine. Atlas V configurations that utilise strap-on boosters for greater lift capacity utilise the RD-180-powered Common Core Booster (CCB) or the AJ-60A solid rocket booster (SRB). SRBs are used within seven Atlas V configurations hat have been launched at least once and nine that have never been launched. The configurations utilise between 1 and 5 SRBs. Both Atlas V Heavy variants (HLV / 5H1 and HLV DEC / 5H2) are given additional thrust via two CCBs. Neither of the two Atlas V Heavy variants has ever been launched.